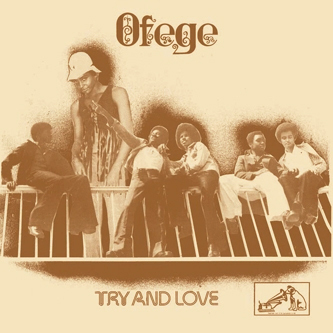 Dazzlingly good Nigerian rock music from the 1970s from Ofege, whose hybrid psych-funk sound sounds like it hasn't aged a day on this wonderful re-mastering job. Although the ear-singeing guitars (caked in fuzztone sustain and wah-wah effects) are likely to command most attention, the subtle and complex work put in by the rhythm section is worthy of great praise too. The band sound great on the slower jams too, channelling the spirit of Jagger & RIchards in ballad mode on 'It's Not Easy' and carving out stellar organ-driven blues on 'Try And Love'. "Ofege recorded this LP while still in high school in Nigeria in 1973, and with its sweet harmonies, wailing fuzz guitar and virtuoso drumming, it quickly became a classic of the Afro-rock genre. Mastered by Tim Warren from the best possible sources, 'Try And Love' is available for the first time in over 35 years, officially licensed and lovingly pressed."